If you subscribe to SiriusXM in the US or to either Sirius or XM in Canada, you can get online access to premium radio content. Unfortunately, tuning in with a browser is clunky at best. With Pulsar for Mac and an online satellite radio account, you can access all this great content directly from your desktop! Pulsar for Mac provides instant access to SiriusXM online stations. Pulsar for Mac now has full support for the new SiriusXM in the US. Listen to and pause satellite radio. No timeouts and no browser needed! Pulsar provides instant access to SiriusXM online stations. Pause audio, then pick back up where you left off or skip to the next song. 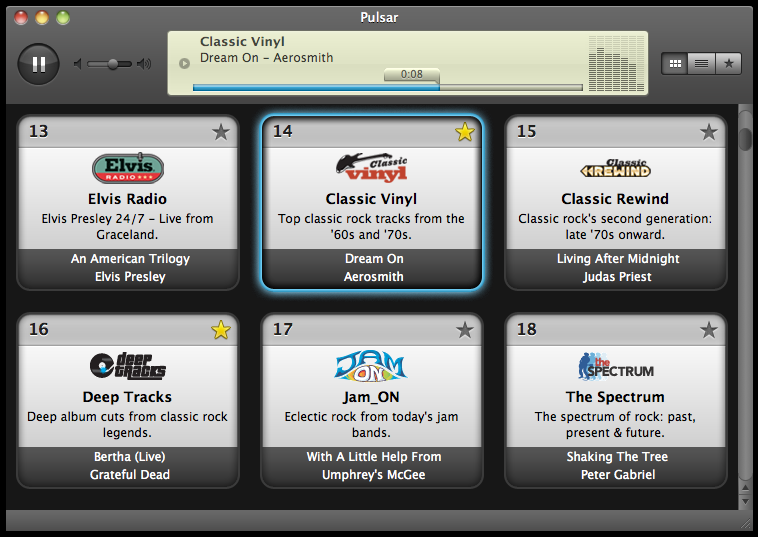 In addition to US accounts, Pulsar supports Canadian XM and Sirius accounts. Just enter your account info once, and you'll be ready to listen. Break free from your web browser for listening to online satellite radio! The channel guide provides info on all available online stations. Now you can sort your Favorites. Make the most-used the most accessible. View what's playing on every available station, by scrolling the listings. Save your most-listened stations as Favorites, for fast access. Genre - arcade 3D scroll shooter with classic gameplay. Qweas is providing links to Pulsar for Mac 2.3.1 as a courtesy, and makes no representations regarding Pulsar for Mac or any other applications or any information related thereto. Any questions, complaints or claims regarding this application Pulsar for Mac 2.3.1 must be directed to the appropriate software vendor. You may click the publisher link of Pulsar for Mac on the top of this page to get more details about the vendor.